Its electric trains may have been homely-looking to say the least (see last week’s entry), but in other areas of its business, Britain’s Southern Railway seized on Art Deco (and Streamline Moderne, in particular) during the inter-war period, under the general manager-ship of Sir Herbert Walker. While it’s not easy to say definitively that the Southern’s interest in Art Deco was a personal decision by Walker, there was little he wasn’t involved in at the Southern Railway before his retirement as general manager in 1937 (after which he stayed on as a director). And it was in the period leading up to his retirement that the Southern embraced Art Deco and Streamline Moderne. For a start, there were the Art Deco posters (examples of which you can see here, here and here). But most importantly, there were the Streamline Moderne buildings. These gained the nickname “Odeon-style” after the British Odeon cinema chain, which notably constructed Streamline Moderne buildings to make an impact in town centres. Most of the British public wouldn’t have been aware of Streamline Moderne’s origins, but they would almost certainly have seen an Odeon in a town nearby, and Odeon’s bold architecture made its cinemas extremely memorable. It’s little wonder that they assumed the Southern Railway had borrowed from Odeon, rather than realising that both were utilising an established movement. Many of the Southern Railway’s Streamline Moderne buildings are of a quality every bit as good as the Art Deco stations on the London Underground at locations like Boston Manor and Cockfosters. Yet while those on the London Underground are famous, and jealously protected and cared for by London Underground, hardly anyone seems to know about the Southern’s Streamline Moderne buildings. And they certainly aren’t being looked after and promoted like London Underground’s Art Deco stations – more’s the pity. There are so many beautiful buildings bequeathed to the British Railway network by the Southern Railway that it’s hard to know where to start. Stations such as Surbiton or Tolworth are (or should be, if they were cared for like London Underground cares for its Art Deco properties) beautiful examples of the style. But this week, I think we’ll go to Wimbledon, in south west London. The station’s main building was constructed in the late 1920s to a restrained (and, to be honest, not very remarkable) Art Deco design executed in Portland Stone. It’s not the entrance that’s actually the interesting thing about Wimbledon station. Nor is it the fact that Wimbledon station is served by London Underground, South West Trains, First Capital Connect and London Tramlink services, all at the same level on adjoining platforms. It is that the Wimbledon commuter, no matter how cold, wet or windy their wait on the platform is, can revel in the sight of a beautiful piece of Streamline Moderne architecture while they wait for their train or tram. At the north end of platforms 7 & 8, ladies and gentlemen, I give you Wimbledon “A” signal box. Like a tiny ocean liner carried inland on a freak wave, Wimbleon “A” has washed up and come to rest in this busy corner of the railway network. With its rounded lower ‘hull’ (complete with moulded concrete cornice), glazing all the way around the upper ‘deck’, and that wide concrete canopy overhanging the top (this had the very practical function of keeping the sun from shining directly into the signal box and thereby distracting the signalling staff), it really only needs a funnel on the top to complete the illusion that it is a tiny ship. 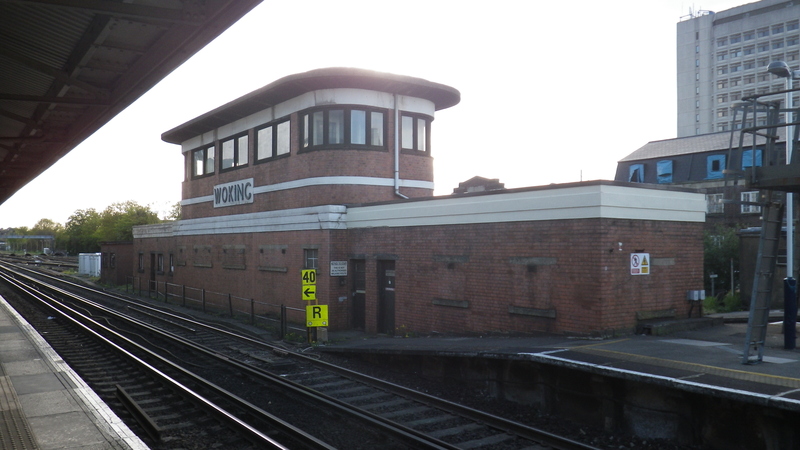 It is one of the best examples (for my money, it actually is the best) of the Streamline Moderne-design series of signal boxes instituted by the Southern Railway. Although to the Southern Railway’s design, it opened in 1948, under the auspices of the recently nationalised British Railways. 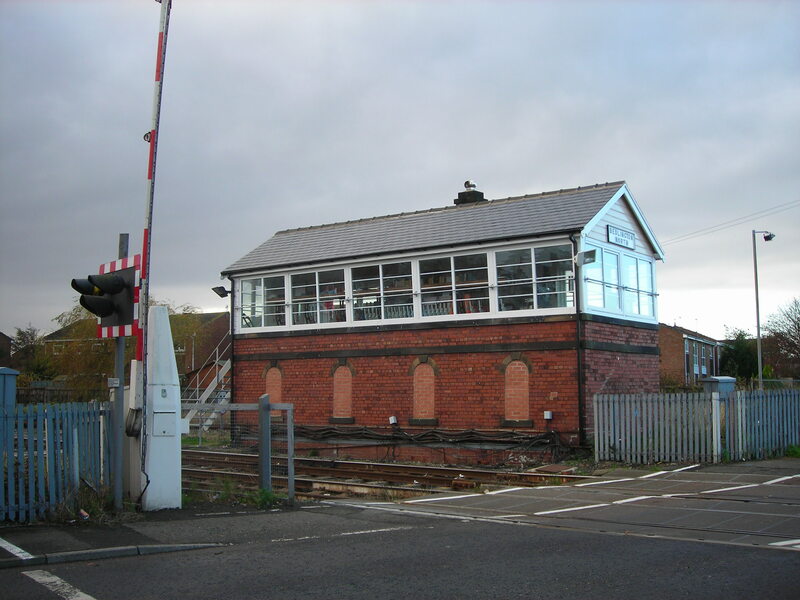 As well as gaining the nickname “Odeon-style”, these buildings are also known as “glass house” signal boxes because of their prominent glazing, while English Heritage terms them “Type 13” in its Railway Signal Boxes – A Review (John Minnis, 2012). English Heritage has given listed status to similar Type 13 signal boxes at Woking (1937) and Horsham (1938) at Grade II, but neither of these are quite as good as Wimbledon “A”, I reckon, though they are earlier examples and were opened during the life of the Southern Railway itself. Woking’s box has flat ends on the lower storey rather than the delicious curved ends of Wimbledon “A” and it is partly situated, slightly awkwardly, on the ramp at the end of the platform. Its upper storey is taller than Wimbledon’s which highlights the nameplate, placed over a concrete band of its own, but the taller upper storey makes the overall proportions less ship-like. That said, Woking’s glazing run on the upper story has narrower brick sections between taller windows, giving it a very slick top deck compared to Wimbledon “A”. Horsham signal box, meanwhile, also has flat ends to its lower storey. Railway Signal Boxes – A Review says that other good examples of Type 13 signal boxes can be found at Arundel, Bognor Regis and Dorking, and so they can. But Arundel’s is an asymmetric design, with the curved top deck and windows on only one side (it’s placed to the side of the track, rather than between tracks, so it only needs windows on the side facing the track) and flat side on the other. Bognor Regis’s lower deck is stumpy and squared off at the ends, while Dorking’s is also an asymmetric design off to the side of the tracks. 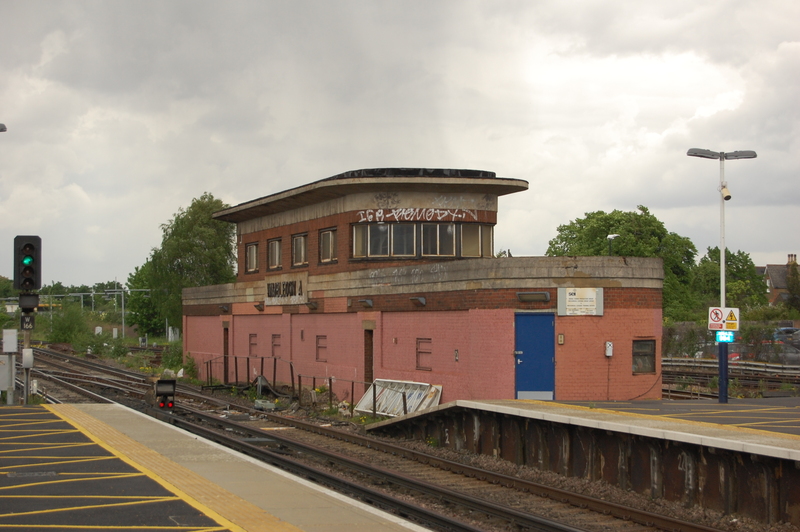 No, I’m still firmly of the opinion that Wimbledon “A” has it all: curved at each end and symmetrical from side to side; the most completely realised Streamline Moderne signal box Britain has ever built. Maybe English Heritage will list it too, one day. Along with its brethren, it announces its name in stylish relief lettering, each letter individually formed. The identity of the architect of Wimbledon “A” is something of a mystery. The Southern Railway’s chief architect during the 1930s (when the Streamline Moderne signal box design was created) was James Robb Scott (1882-1965). As chief architectural assistant at the London & South Western Railway (one of the companies that was eventually grouped into the Southern Railway in 1923), Scott designed the frontage and Victory Arch entrance of London’s Waterloo station (Scott seems particularly difficult to find information on, so thanks to the very helpful Dictionary of Scottish Architects website page on him for the best information I’ve been able to locate so far). Yet Waterloo station and the Southern Railway’s Streamline Moderne buildings have almost nothing in common with one another. The Victorian Web website notes (here), “Scott’s architecture is, for the most part innocuously late Edwardian. However, his triumphal arch is a splendid example of the style that has been described as “Imperial Baroque” (I love that “innocuously”, by the way). Both are a far cry from the clean lines of Wimbledon “A” and the Southern Railway’s other Streamline Moderne buildings. Scott headed a design team at the Southern Railway, and the Dictionary of Scottish Architects details a theory that it was the design team, rather than Scott himself, which undertook the Streamline Moderne designs. But it also notes there’s no firm evidence that Scott didn’t design the buildings. It seems unlikely that British Railways’ first chief architect (and you try to find out who that was, or if the position even existed…) could have had much of a hand in something that was clearly a Southern Railway design. 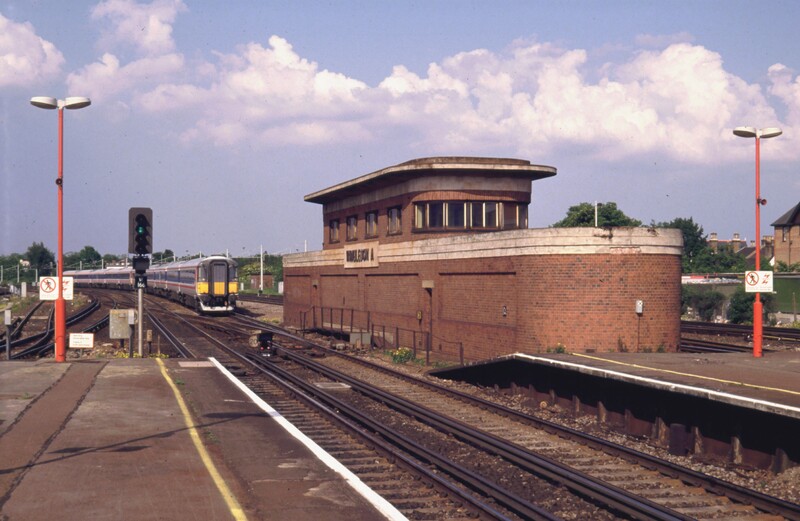 Wimbledon “A” was closed in 1991 and its duties taken on by the modern Wimbledon Area Signalling Centre. Although you can see the latter from passing trains if you know what you’re looking for, you probably won’t have noticed it. It’s an entirely non-descript warehouse-like building clad in grey corrugated metal. A greater contrast with Wimbledon “A” it would be hard to imagine. It’s expensive to maintain redundant transport buildings, as discussed on other occasions. The only sources of revenue available to Network Rail (the British railway infrastructure company which is the owner of Wimbledon “A”) are the taxpayer and, indirectly, the fare-payer. Neither are likely to be too impressed with paying to preserve buildings which don’t have a current use. But surely, the small amount of money it would cost to maintain such structures is worth it to ensure the survival of something which is beautiful in its own right? 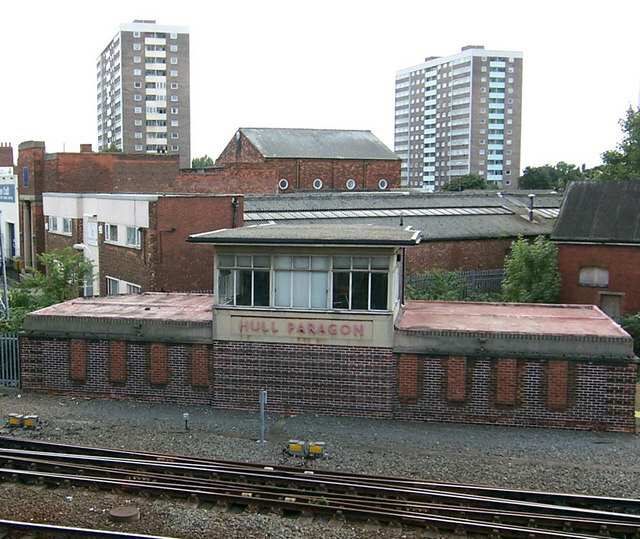 Our cultural lives would be so much the poorer without buildings like Wimbledon “A” signal box. To its credit, Network Rail recognises its heritage obligations regarding signal boxes as it moves to create just 14 signalling super-centres which will control trains across the entire country, and render redundant pretty well every signal box in the country. You can contact Network Rail if you want to acquire any of its redundant signal boxes. Perhaps the salvation of Wimbledon “A” lies there. Transported brick-by-brick to a suitable location, restored externally and converted internally, it would make an amazing holiday property, wouldn’t it?